Tucked within towering pines alongside Bass Lake, our Yosemite mountain resort features a variety of accommodations and vacation rentals. Choose between 84 inviting mountain chalets, 20 deluxe lakefront suites or two private, fully-furnished houses, equipped with an array of thoughtful, modern amenities. All resort accommodations reflect a contemporary mountain décor, inspired by the scenic, natural surroundings. They also feature stunning forest or lakefront views and are within easy walking distance of the lake, the resort's restaurants, recreational activities and retail shops. 84 cozy, two-story mountain duplex cabins are nestled on the hillside, surrounded by the ponderosa pines. These spacious chalets are perfect for couples as well as families. Each chalet, measuring 620-700 square feet, features 1 king or 2 queen beds in the downstairs bedroom and a pull-out sofa in the upstairs living room, opening up to a semi-private deck with a table, chairs, and a charcoal barbeque. In addition, they come with several notable standard and optional features, including fully-equipped all-electric kitchens with basic cookware, dishes and utensils, fireplaces, partial lake views or scenic forest views. If you are traveling with your four legged companion, we will be happy to accommodate you in our dog-friendly rooms. 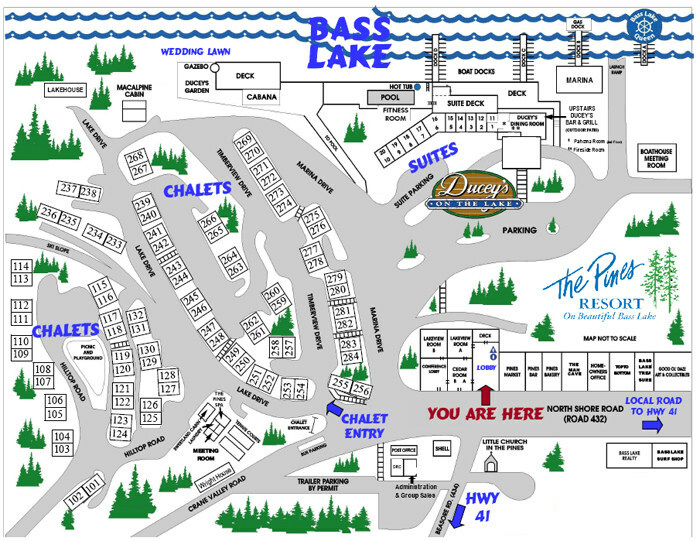 20 upscale hotel rooms are housed in an inviting lakeside building, right by Ducey’s on the Lake. Our 420 square feet, split-level suites feature full or partial lake views of Bass Lake, along with plenty of thoughtful amenities, including in-room wet bars, king beds, full baths, mini refrigerators, microwaves and cozy sitting areas with sofa sleepers, desks and log fireplaces and open up to a balcony or a deck. For a special occasion or just to enjoy your getaway to the fullest, we have Spa Suites and an Executive Honeymoon Suite that offer in-room spa tubs with full lake views.